:Rachel Matthews isn't one to rely on others to take care of her. Destitute and alone, she still wants to make her own way and her own money--even if she's forced into the life of a dance hall girl. Horrified by her circumstances, Rachel's brother sends a friend--the widely admired cattle baron John McIntyre--to rescue her, then sets off to earn enough money to buy back the family ranch. But when months pass without her brother's return, Rachel isn't sure she can take one more day in John McIntyre's home--especially once she discovers that he's the one who holds the deed to her family's ranch. Sparks fly between this spunky, independent heroine and the ruggedly handsome hero as they navigate the snarled terrain of pride, greed, faith, and love in Maggie Brendan's delightful series set in the Old West. 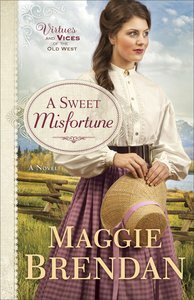 About "A Sweet Misfortune (#02 in Virtues And Vices Of The Old West Series)"